On this day after Christmas I’m missing winter. Winter is a time of year which really needs some good press and I for one enjoy the clean crispness and simplicity of the season. On the other hand this weather we’ve been having seems like an endless autumn, and those who read this blog may already know my lack of enthusiasm for that season. If I was forced to rate seasons, autumn wouldn’t even make the top three. The front door did get some holiday attention this year with a homegrown selection of evergreens and bits from the woods. Regardless of my feelings of ennui towards the garden, and my wish that the seasons would just move on with it, I have managed to get a few things done. The Christmas lights and holiday decorations have never gone up as comfortably, and even though they’re a mismatched collection of leftovers and scavenged pieces they suit us just fine. 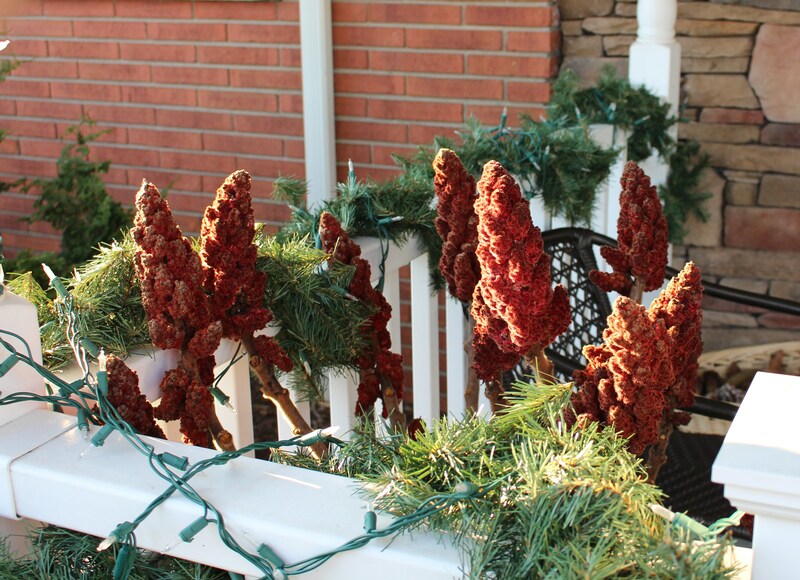 Staghorn sumac (rhus typhina) seed heads catching the solstice light. I often admit to ‘economizing’ my actions in the garden, and some equate this to laziness, but sometimes this leads to a few nice surprises. Without freezing temperatures it was much easier to push evergreen boughs and branches into the soil of this summer’s planters rather than working out something new. 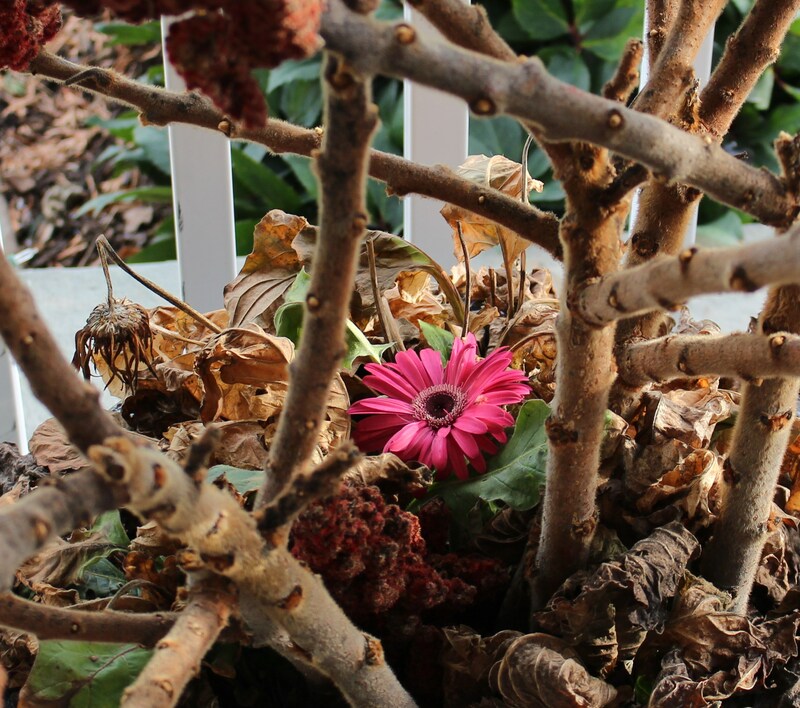 Imagine my surprise when on the way out the door for Christmas dinner I was treated to the most perfect gerbera daisy rising up out of the dried debris. A single gerbera daisy welcoming Christmas. I’ll admit a single daisy is not quite as thrilling as a hedge full of blooming camellias or sheets of early snowdrops but it does make the lingering autumn a little more tolerable. 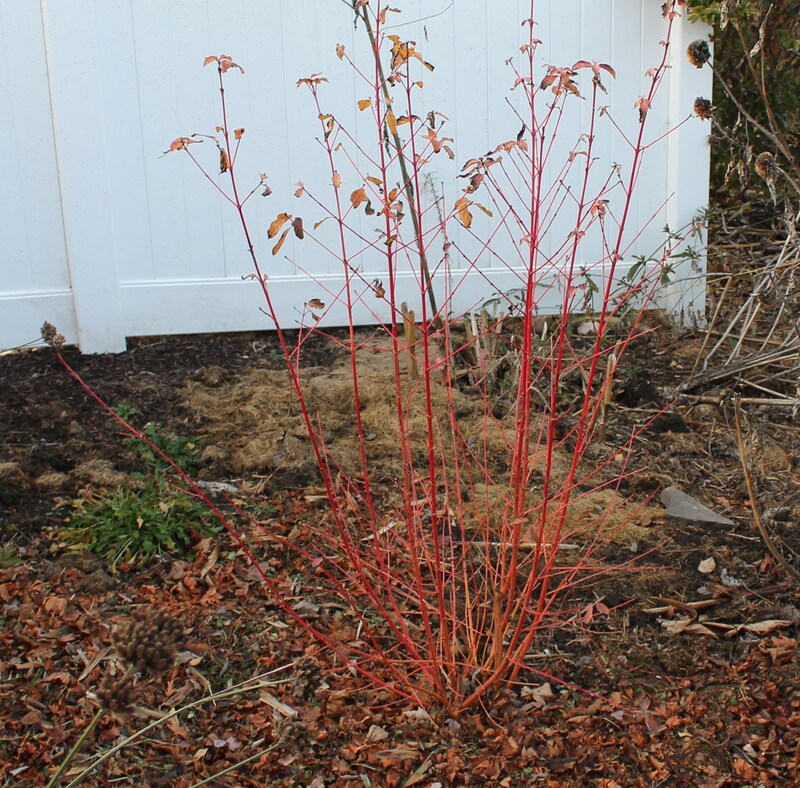 Also making the autumn more tolerable are new bits of winter interest such as my growing evergreens and this nicely colored red-twig dogwood (Cornus sanguinea ‘Midwinter Fire’) which a friend surprised me with. ‘Midwinter Fire’ dogwood belongs to the tribe of redtwig dogwoods. I love how the branches in the inner portion of mature plants get a yellow orange color while the ends turn darker red. The long autumn hasn’t been a complete bust. Between leisurely bulb planting and leaf cleanup I’ve still managed to drag myself out for a few other small projects. 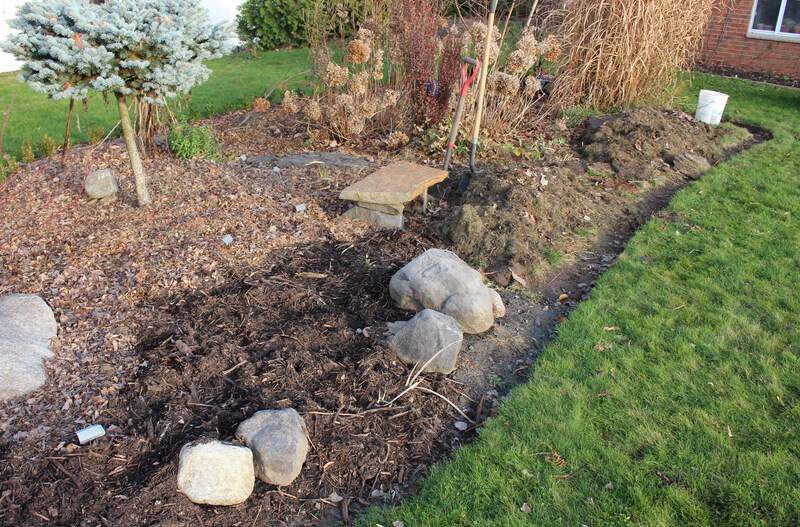 I finally removed the invasive burning bush (Euonymus alatus) which anchored the end of the front border. Bright autumn color wasn’t enough to save this wolf in sheep’s clothing. There are other burning bushes (Euonymus alatus) planted throughout the neighborhood but I’m not going to let this one contribute to all the invasive seedlings which have begun to show up. I can see why the bush did so well in this poor spot. The roots became a thick fibrous mass in the six years it’s been here and I’m going to be on the lookout for root sprouts in this area over the next year or two. A prime clear spot in the front border. I promptly filled it with daffodils and tulip bulbs, yet will need to watch for burning bush seedlings and other invasives. One of these is the Korean feather reed grass (Calamagrostis brachytricha) which still turns up three years after the mother plant was evicted. What I should really get done is more bed prep. Fall mulch and compost are the best things for this but my spirit is slightly broken in this regard. This fall I did my usual whoring around in neighbor’s gardens, selling myself for far too cheap for the chance to take home some beautifully chopped autumn leaves. It was all going well until I discovered my haul was missing. Who had been watching and waiting to steal my treasure? The six bags of mulch were tucked out of sight behind a large panicum clump next to the driveway just waiting to bless my compost pile with leaf mould goodness. They were heavy. I know that because I lugged them out of the neighbor’s backyard and jammed them into the back seat of my car to get them home. Long story (and several phone calls around town) ends up with the township yard waste collectors trying to “get ahead” in their collections. They came up the driveway, found the bags, and hauled them away to the dump. My only consolation after calling all over to “get my leaf bags back” is that I found out where free mulch is available, and if I can drive, lift, and lug for a few trips I might be able to ease the pain. Another bed expansion with a nice edging trench, leftover lawnclipping ready to spread to smother the turf, and a topping with township mulch. Chopped leaves would have been nicer. Just saying. Other beds have been cleaned, other plants have been moved, bulbs are in, weeds are out. There’s always plenty to do but my heart’s just not in it. I’m moving into winter garden mode and hopefully between now and New Year’s I can get that set up properly. Snowdrops are coming after all. My first snowdrop for this year. I have it on authority it’s a Galanthus elwesii var. monostictus Hiemalis Group ex Montrose… unfortunately the label needs supersizing before I can update. 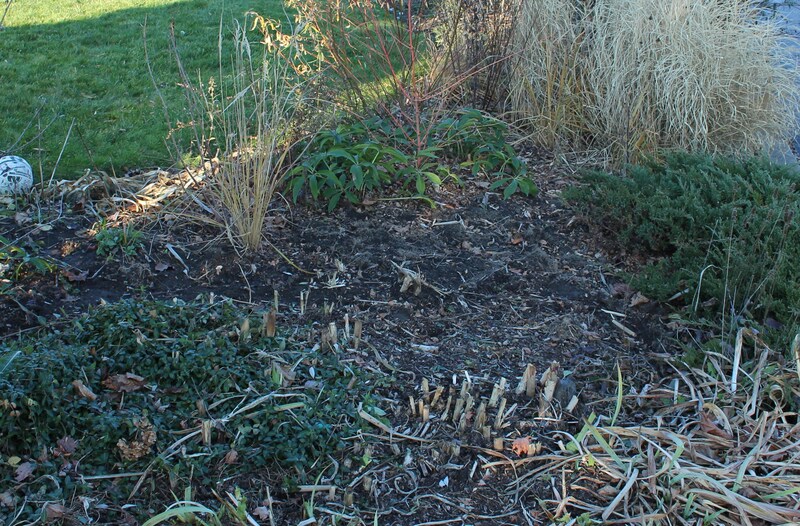 This entry was posted in fall, garden stories, shrubs, snowdrops, soil prep/compost, winter flowers and tagged el nino, fall gardening, fall snowdrops, invasive plants. Three cheers for burning bush removal! 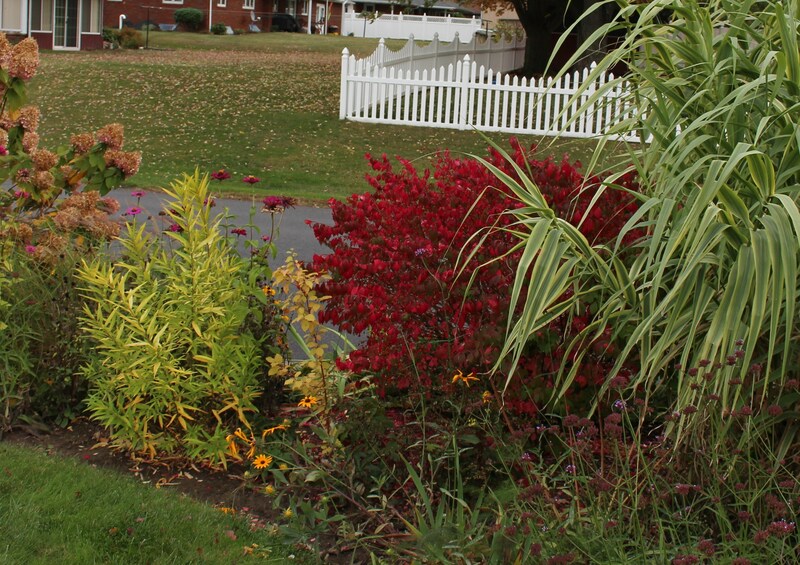 I did the same when I moved here, evicted burning bush and barberry. I don’t think you’re ever going to forgive the town crew for taking those leaves. We aren’t quite as warm as you, but I feel the same. Yes, I could be pulling weeds, but they’re supposed to be under snow where I can’t see them. It was about time to get rid of the burning bush… There were seedlings coming up under any spot where birds perch and I’m sure they’ll be showing up more and more in the woods. Out of sight, out of mind. That’s also how I like my weeds! We’ve been super warm and moist, too, and as much as I love a good winter chill (while I’m by the fire in my sweats), this extended fall has been a boon for the garden because all the plants I added or transplanted have had a chance to establish themselves well in their new spots and pump out loads of roots that will keep them from heaving when it finally does get cold. The past few winters I’ve lost plants to heaving and have had to make emergency runs to the local nursery to buy expensive non-frozen bags of potting soil to build up the areas that settled too much around plants that were being pushed out of the soil. It was pricey and frustrating. I think many of us who are experiencing this unusual weather are having mixed emotions about it. I must admit that I am not a cold person so I am enjoying the warm. And besides, it saves on the heat bill. Have a grand New Year. I am looking for snow as the garden looks like late fall will never end…altho we have snowdrops, vinca, lamium, honeysuckle blooming as well as an very early witch hazel….strange winter here. And I have done no garden work as the rain has been flooding and the garden is sodden. Well here’s to a New Year in the garden. I expect snow will fall soon. There’s a chance of snow and ice tonight but I think after a few colder night it’s all back to above freezing. I hope plants aren’t tricked even more into thinking winter came and left. I don’t want to spend all of January and February worrying about sprouts which grew too much during some new year’s warm spell… Plus the ski resorts will be crying a river if things don’t cool down soon! Hi Frank. Hope you’ve had a good Christmas. The Gerbera was a nice gift! It has been extremely mild in our part of the world too, with no sign of snow yet. So glad you have got at least one snowdrop flowering! Mine are pushing shoots out the ground and may be in flower in a week or two if this weather continues! The early shoots are going to make a mess of my cold relaxing winter. I feel much more at ease when things are locked up in ice rather than growing and waiting for some winter hammer to come crashing down! It’s much the same situation as Donna’s here.. Totally sodden ground and continual rain. I did a couple of hours yesterday though, between the showers, and it felt good to be out in the fresh air (aka roaring gale). What bad luck that was to have your leaf mulch collected after all your efforts. The ‘Midwinter Fire’ dogwood is lovely. We’re having warm weather also, but it’s so wet that the garden is saturated and more. Saw a daffodil blooming in the neighborhood. Glad you have a daffodil. 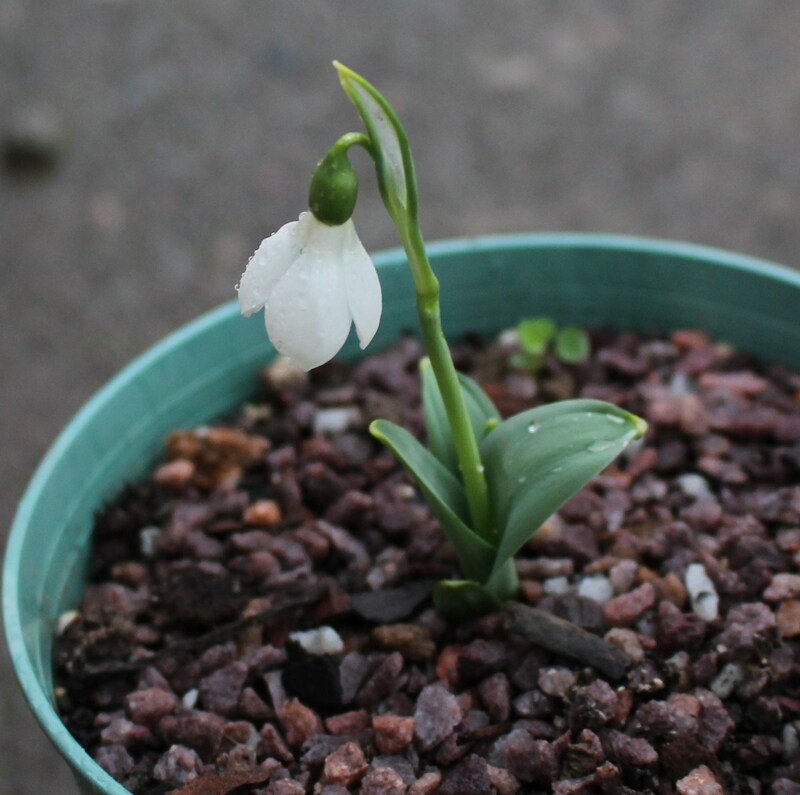 My single snowdrop is the only thing which has been tricked into an early spring. The other plants are pretty sure winter is yet to come and are still safely tucked in… Unless of course the warmth stays around longer, then all bets are off! I thought of you when my leaves disappeared, somehow it seemed like your reaction would be completely different if a few bags walked off! Don’t know how long yours typically stay around but in this Town they take yard waste only about every 2 1/2 weeks. I got spoiled in my prior Town which used to take it every Thursday! As far as I know they come every Tuesday… but since nearly everything goes into the compost I never have things out. You would think that’s one more reason not to come up near the house and take something! Winter finally returned with cold, snow, ice and high winds. Only a few inches but the garden looks gorgeous. The last small mound of unspread mulch is now just a white wave instead of a guilty job staring at me every time I looked out the window. I would kill my city crew if they came up my driveway. I hope the fact I have no grass would be a clue to keep out! The more I’ve thought about it the more annoyed I’ve become. At first I was grateful for their work ethic, now I’m just think about all that missing mulch. There’s a chill in the air today, but the snow and ice were limited to the higher elevations. That gives me a few more days to get into the winter mood! Forgot to ask if you bought any expensive new snowdrops. I restrained myself since I bought so many other pricy bulbs this year. haha, I also restrained myself for the same reasons. There will be plenty of new goodies this spring, but I’ve been throwing myself on the mercy of others and trying to avoid going in too deep…. Who am I kidding. I’m already in too deep, but I am trying to hold off until the Temple Gardens list comes out! Sorry you’re having an endless autumn. 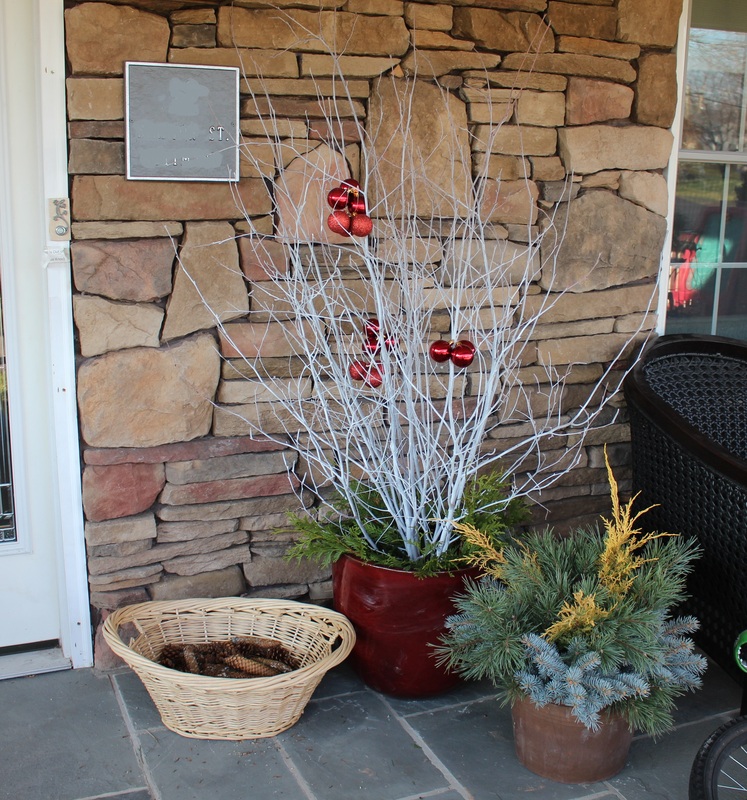 On the bright side, your winter decorations look marvelous. Wishing you plenty of snow and cold to begin 2016! May you have a prosperous, happy, healthy, and peaceful 2016 surrounded by loved ones and great plants! Looking at the thermometer this evening I feel silly for having ever complained about warm weather. It’s down to 10F and still going down as a brisk wind blows… There wasn’t even a bit of frost in the soil two days ago. All the best for you as well in 2016… and (more) great plants! Oh Frank, this doesn’t sound like you at all and I hope you’ve since recovered your usual cheerful self. I know the reason why you’re down: it’s because you’re longing for spring and it seems further away if we don’t have a proper winter. 😉 I for one don’t like winter one bit and I’m delighted with the winter flowering shrubs and the mild weather. Temperatures dropped a bit though thankfully as I don’t want to have Magnolia & Co. flowering now. That new bed extension looks promising – any plans yet? Plans for the new bed keep changing. Last night I was considering a mass of dahlias in order to keep the bed well cultivated and get the upper hand with weeds, last month it was chrysanthemums and bearded iris…. next week it might be zinnias. You know how it goes!